Zakynthos is very much two destinations rolled into one. The south and east of the island have the tourist resorts, while in the west and north you get the authentic island. However, wherever you go the locals are warm and friendly. Whilst the island is large, the winding roads make it seem a lot larger. Its history goes back as far as the Ancient Greeks, but you won’t see very many buildings more than 65 years old, because in 1953 the Ionian islands were struck by an earthquake which destroyed nearly everything. The resorts are similar to others, from the Algarve to Anatolia. We stayed in Argassi, which consists of a mile long street of souvenir shops, bars, restaurants and car rental offices, with hotels and apartments interspersed. There is no proper beach at Argassi, which is common for the island. We had to take a bus to find a beach you can lie on. It seemed most people preferred to sunbath by their hotel pools. ​The resorts are popular and prices are competitive, with main courses for dinner in the restaurants and tavernas costing around €10 - €12 and a large beer plus a large glass of wine around €7.50. Some places provide free entertainment at night, with some very good ‘tribute’ acts on show. Tipping is considered not only normal, but essential. 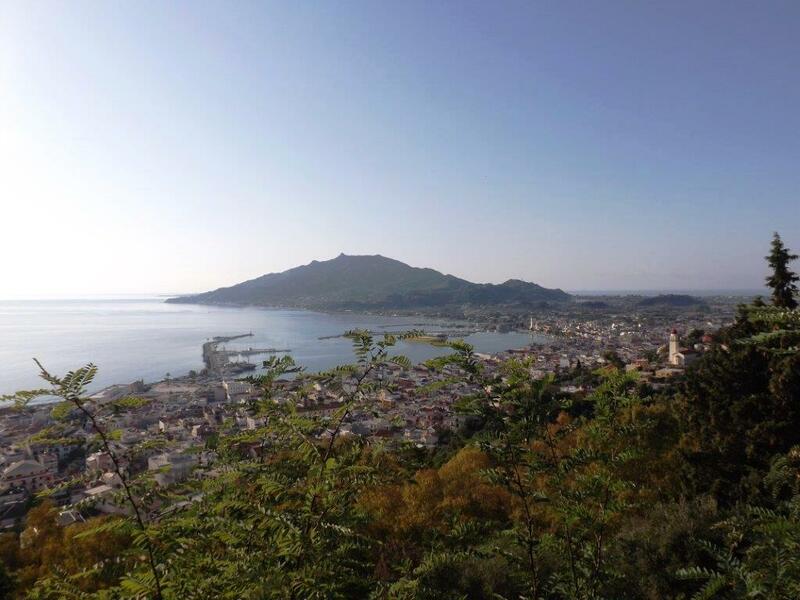 The other Zakynthos, however, is the real gem. The scenery of the north and west of the island is beautiful with some lovely hidden coves. The island tours are well worth taking as they cover the majority of the interesting places. However, if you fancy going your own way there are plenty of places where you can hire cars, motor scooters and quad bikes. 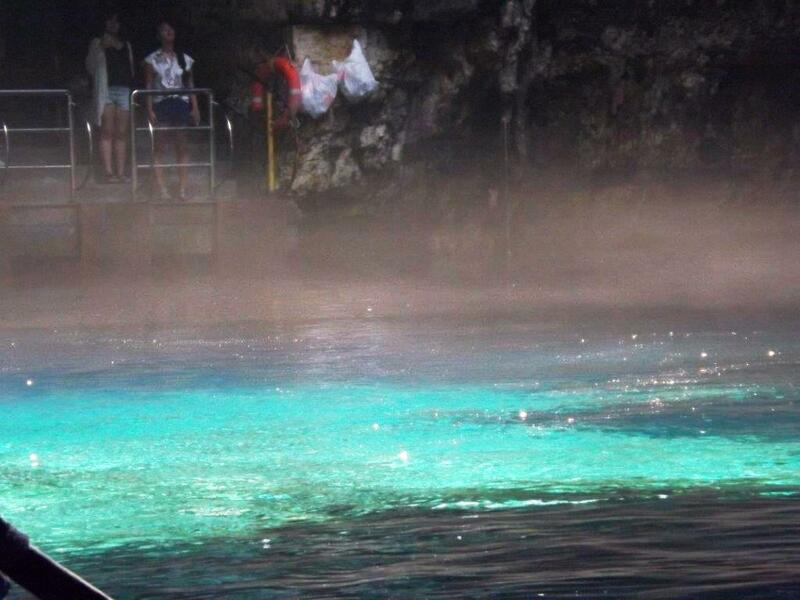 The highlight of our island tour were the Blue Caves. The name derives from the colour of the water in the caves, which is caused by the way the water is reflected off the submerged limestone rocks and sand. The caves can only be visited by boat. The trips, which depart from Porto Vromi (see picture) are quite short, about 30 minutes for which we paid €6. ​One of the most famous beaches in Greece is Shipwreck Beach. This is also only accessible by boat. The beach features on many Greek travel posters and websites, along with Myrtos Beach on Kefalonia. One of the other features of Zykanthos are the loggerhead turtles which visit the island to lay their eggs. There are boat trips to the small island where they can be seen and also opportunities to swim with them. 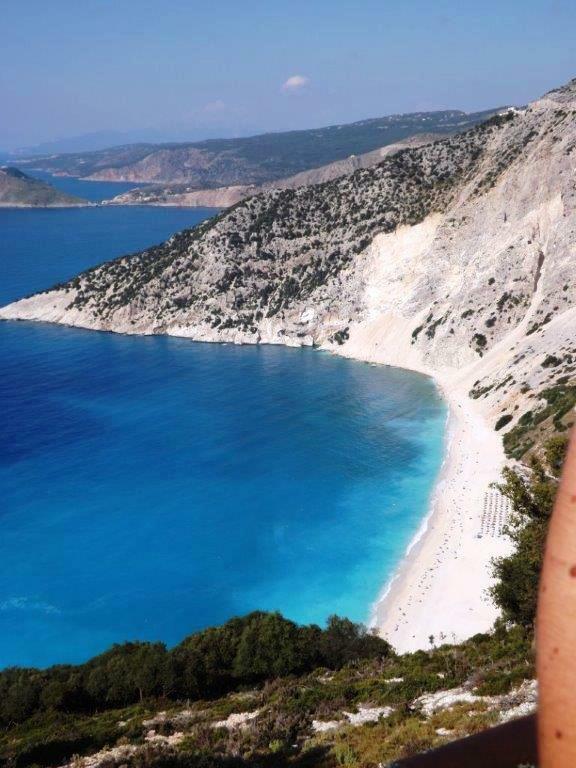 We also took a day trip to nearby Kefalonia and I would recommend this if you have time. We crossed between the islands on a rather ancient ferry but the journey was very enjoyable. You may also be lucky enough to spot some dolphins. Kefalonia is very different to Zakynthos. The people seem more house proud and everything seems to be a little bit better cared for. There is a lot less rubbish lying around and the houses are better maintained. There is some tourism but none of the major tour companies fly there because the island’s airport is too small. You have to travel independently and book your own accommodation. This means it is a lot less frenetic than the resorts on Zakynthos. The island is best known abroad for providing the location for the 2001 film “Captain Corelli’s Mandolin”. 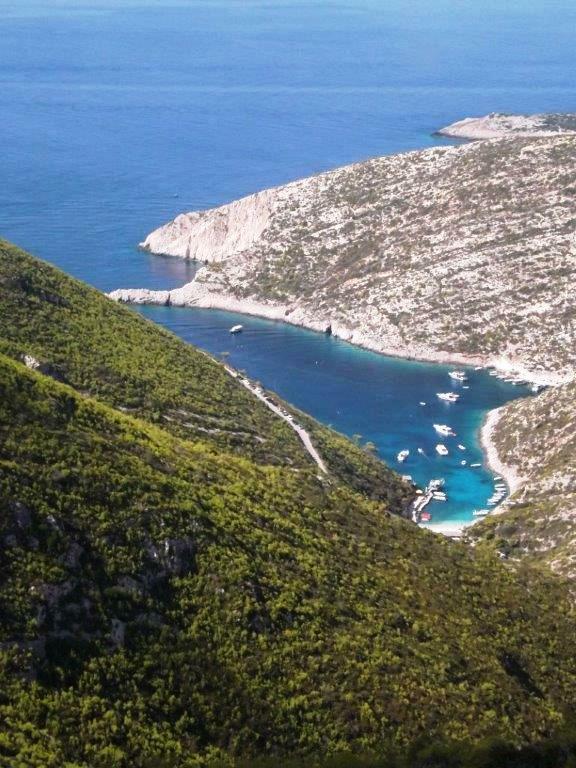 Of the two islands, Kefalonia is more mountainous, which provides stunning views and lovely caves to be explored. Like Zakynthos there are a few small beaches accessible from the road in the area of the town of Sami and a road has been built down to the famous Myrtos beach on the other side of the island. If you venture a walk over rough ground you can have a beach all to yourself and some of the flatter rocky areas also provide a place to sunbath and swim. For me the highlight was Melissani, an underground lake which provides beautiful colours thanks to a large hole in the roof. You are rowed around the lake by a boatman. Each boat carries only a dozen people and there are only six boats. We had to queue for about half an hour despite it not being a peak holiday period. If you travel independently, try to arrive before 1 pm in order to avoid the tour buses. Once on board the boat the trip is quite short but well worth the wait. Don’t go on a cloudy day because you won’t get the colours on the lake as they are caused by the reflection of the sky on the water. The €7 entrance ticket for Melissani isn’t included in the price of the tour. Whether you go to Zakynthos for the holiday resorts or for the beauty of the island, it provides a very enjoyable destination. The sun is almost certainly guaranteed and there are plenty of things to see and do. If you prefer something a little quieter, then book your holiday in Kefalonia.